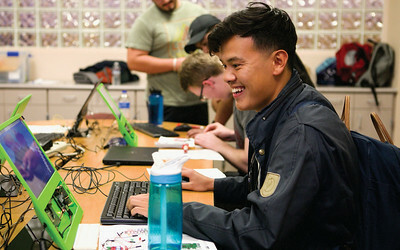 On March 13, MiraCosta College will host TECH Talk, a free event presented by the MiraCosta College Computer Studies and Information Technology (CSIT) Department in partnership with Point Loma Nazarene University. Students, faculty, community members and industry leaders are invited to learn about MiraCosta’s Cybersecurity and IT degrees and certificates, Point Loma Nazarene University’s CIT bachelor’s degree, and network with industry/FBI professionals and corporate recruiters representing MIS, cybersecurity, programming, and digital media. “Based on the success of the first two Tech Talks, with over 150 participants last year, it is a no brainer for the CSIT Department to hold its now third annual event” said MiraCosta CSIT Faculty and event organizer Rick Cassoni. “This year, we are expanding our panelists to include Blockchain, the technology behind cryptocurrency, such as BitCoin, law enforcement (FBI), along with cybersecurity and web development experts, and IT-based job recruiters from four different companies,” explained Cassoni. After a panel discussion, participants can mix and mingle as they enjoy free pizza, and an opportunity drawing to win a Raspberry PI, two mini drones, and more. The event will be held on the Oceanside Campus, 1 Barnard Drive, in the Administration Building, room 1068, from 5–7 p.m. Register online. For more information about the TECH Talk event or CSIT classes, contact Rick Cassoni at rcassoni@miracosta.edu, call 760.757.2121, x6369, or visit miracosta.edu/csit.